These canonical brain images depict the similarities in conjoint brain activation when thinking of an individual and of a group. In particular, these activated regions coordinate with those associated with the theory of mind. Courtesy of Joshua Knobe. How many times have you been told stay off the bandwagon, to not give in to a certain mentality solely because other people were as well? The psychology of groups and how individuals perceive groups has long been a mystery, but recent research by Associate Professor of Cognitive Science and Philosophy Joshua Knobe reveals another aspect of human complexity. Knobe’s study involved two experiments. The first revealed that people, referred to as perceivers, attributed a particular mentality to an entire group but did not ascribe that same mind set to individuals within the group. Knobe explained a real-life application of this phenomenon: “Say that Yale Cognitive Science is in debt. 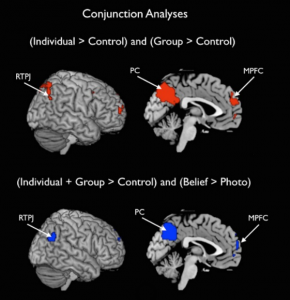 That does not mean that the people within it are in debt, just the organization itself.” The second experiment demonstrated that the brain does not distinguish between a group and an individual when assigning a certain mentality—shown by the activation of the right temporo-parietal junction, a region typically associated with theory of mind—when attributing thoughts to corporations. Some psychologists argue that when people say “The Catholic Church believes capital punishment is morally wrong,” they’re not actually attributing a belief to the Catholic Church, they’re just using the word believe; this study, however, provides direct evidence against this argument. These findings could have major political and economic implications as they relate to how people perceive and interact with governments and corporations. More research will be done in this area in years to come, furthering our understanding of the intricacies of the human mind.